So, I happened to be in Posman’s, the independent bookstore at Grand Central, the other day, and noticed these two books stacked one beside the next. 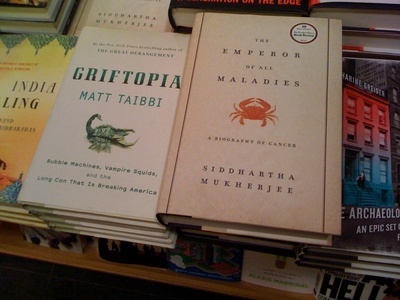 Which is to say, Rolling Stone ace reporter’s Matt Taibbi’s Griftopia: Bubble Machines, Vampire Squids, and the Long Con that is Breaking America, and Siddhartha Mukherjee’s National Book Award-winning The Emperor of all Maladies: A Biography of Cancer. And I suspect that, like you, I couldn’t help but be struck by the similarity in the cover images. Which in turn got me to thinking about an op-ed piece Walter Murch and I contributed to the Los Angeles Times about a year ago (May 23, 2010), which I herein offer as a gloss on this particular not-so-innocent coincidence. Economy: The Trouble With Bubbles. — Isaac Newton, after losing the equivalent of $3 million in the financial catastrophe of the South Sea Bubble in 1720. The word “bubble” just has an inescapably happy feel to it, conjuring up kids and parties and sudden iridescent poppings, screams of laughter, the giddy clapping of happy hands and an overall lack of consequence. That was fun; now where’s the cake? Even more so when the word gets paired with “tulip” or “South Sea.” Where could the harm possibly be in such blithe and fragrant things? Certainly not in the words themselves: exotic petals, swaying grass-skirted maidens, spheres of trembling insubstantiality. Things get a bit more pedestrian with the more recent dot-com and housing bubbles. But still, seriously, where’s the harm? Well, to paraphrase Christopher Wren’s epitaph: If you seek its monument, look around you. The financial wreckage from this last housing bubble (that outbreak of “irrational exuberance”) is still being inventoried, and its consequences are considerably more serious than the wet smacking pop associated with the word itself. Nor was there any cake (unless it came in the form of those sweet bonuses handed out as party favors to the executive celebrants up and down Wall Street). And yet, despite the economic damage of the last few years, we are repeatedly soothed by the innocence of the word “bubble” itself. Lulled by language, we’re invited to contemplate, with relative equanimity, simply getting to hear that fateful “pop” every so often, as the inevitable price to be paid for the market freedoms of the unregulated capitalistic system. Ah well: Kids will be kids. But what if we were to conjure another metaphor? Perhaps a more apt analogy. Might it help rouse a more pertinent response? For most of us, most of the time, this pre-cancerous froth never proves a problem because there is a regulatory agency — the immune system — that quickly identifies those rogue cells, reminds them who they really are and encourages them, as it were, to commit suicide, a process known as apoptosis. This fatal encouragement can come spontaneously from within the cell itself (suddenly recognizing its own roguishness) or from the surrounding healthy cells (a neighborhood group enforcing community standards) or from immune-system “police” cells patrolling the body as a whole. This process is happening constantly, is part of the normal functioning of the healthy organism and gets accomplished without any awareness on our part. Trouble occurs when, for some reason, the normal functioning of apoptosis breaks down — the cell’s own compunction fails to kick in, the surrounding cells prove too weak or are otherwise distracted, the local regulatory agency is asleep at the switch — and the cell in question cannot be persuaded to end its life. Instead, it multiplies exponentially, becoming the seed of a cancerous tumor. Only now, at a certain threshold, does the greater organism become aware of it, and an existential conflict ensues. The tumor is now set against the interests of the greater organism of which it was once a part. Its brief is to flourish at all costs, to thrive at the expense of the surrounding healthy tissue. Followed to its inevitable conclusion, this means doom for both the host and the tumor. Though, of course, until that dreadful “pop,” the tumor doesn’t see it this way. Would anyone seriously gainsay the highest possible vigilance over the proper functioning of their own body or doubt the need for strong regulation? Who, facing the prospect of a tumorous outbreak or living with a body demonstrably prone to such outbreaks, would entrust that body to a band of physicians blithely committed to laissez faire regarding these fatal bubbles of flesh? Words matter. Metaphors frame thought. Pay them heed and tend them well.